San Antonio Missions National Historic Park contains four of the five Spanish missions. The fifth and most well know is the Alamo, but it is under Texas control and not part of the National Park system. On a recent drive to San Antonio, I had the opportunity to photograph two of these missions - Mission Concepcion and Mission Espada. Both rest just south of downtown San Antonio, and are worthy of an evening. The grounds are clean and well cared for. The stone structures take you back to a time in Texas history when times were more challenging. This past week I visited the iconic stone building just north of Marble Falls, Texas, that sometimes has bluebonnets in the front field. After more than several years of nothing but grasses, this year’s display is quite nice – probably the best in 5-7 years. I’ve driven all over the hill country in the last few weeks, and this is about the best coverage I’ve found in a field. (The roadsides are nice in several places, but there are not many fields full of flowers). Still, I am grateful for scenes like this. Guadalupe Mountains National Park is a long way from my home in the Hill Country, but the drive is pretty easy and the Texas landscape changes drastically several times along the 7 hour haul. In the park, Guadalupe Peak might be one of the best hikes in Texas, covering just under 9 miles round trip. The hike takes you to the highest point in Texas and affords commanding views of the Chihuahuan Desert 3,000 vertical feet below. Just below Guadalupe Peak is the more well known El-Capitan, a limestone mountain (the 8th tallest peak in Texas) that has served as a waypoint and landmark for a thousand years. Along with these two mountains, the Guadalupe Mountains are also home to beautiful canyons that house hidden remnants of ancient bigtooth maple trees. Each year in late October and early November, the leaves on these trees show off their fall colors reds and oranges. The trek through McKittrick Canyon is a wonderful day hike, as well. If you have the time, Guadalupe Mountains National Park is a great place to explore. The Barton Creek Greenbelt offers over 12 miles of trails for walking, running, and even biking. Two of the waterfalls found along this creek, Twin Falls and Sculpture Falls, offer nice opportunities to photograph the clear water as it cascades over limestone deposits. Several trailheads give different points of access to the stream - but the most popular is near near the intersection of 2244 and MoPac. Two different mornings, I was the first car there and found myself walking through the dark in order to photograph the falls at sunrise. It is an easy trail, but if you go early on a late summer morning, bring a long stick. (Use the stick to knock down the spider webs in your path!) I encountered so many spiderwebs spun across the trail I am still pulling webs off my arms, it seems. Yikes! But morning walk through the water is refreshing and worth the effort. It is hard to imagine this oasis is only miles from the downtown Austin skyline. Hamilton Pool is one of my favorite places in the Texas Hill Country. I can remember when you could hike in from the back side and look over the edge of the limestone cliffs of the grotto. Later, I remember buying a season pass and visiting many times when no one was there. The tranquility of this little oasis was unrivaled. Today, however, you cannot access this wonderful area without reservations - a necessary evil as the cool waters and shade have become more widely known to the public. So this panorama of Hamilton Pool's emerald waters from the back of the cave may be one of my last at this location - and at least for the foreseeable future - as I have no desire to fight the crowds or photoshop folks out of the quiet beach. It's still a great place to visit, and if you haven't seen it, the extra hassle and money is worth it at least once. We had a good run! To escape the Texas heat in the summertime, I venture up to Colorado annually during June and July and spend time photographing the wildflowers, landscapes, and wildlife in the Rocky Mountains. This summer, I was fortunate to spend about six weeks in the cooler temperatures of high altitude and never saw a day over 79 degrees. I admit it was hard to adjust, but I persevered :-) ! The wildlife was abundant even above tree line, as seen in this image of an elk in Rocky Mountain National Park. The Colorado wildflowers were also abundant at 12,000 feet, especially the golden sunflowers, commonly called "Old Man of the Mountain." See more wildflowers and landscapes in my lone Colorado image gallery. I'm always amazed at how quickly time passes, especially six weeks in Colorado. But now it is back to Texas and time to seek out new and unique photographic opportunities. For many Texans, Port Aransas is a little slice of heaven. I had the opportunity to photograph the beaches there for a few days, spending each sunrise and sunset hoping for skies full of color. Early mornings paid off, and the gulls and herons cooperated as I was able to incorporate these feathered friends into a few images. Along with the birds, Caldwell Fishing Pier makes a nice foreground for these beach photographs, adding a little interest to the Port A landscape. While this beach becomes quite crowded during the summer days, if you walk along the sand at sunrise or sunset, you'll often have longs stretches all to yourself. I'd been trying to reach this location for several years, but the weather had always thwarted my efforts. Finally, using a sunset predictor called SkyFire, I found a potentially good evening to hike the trail in Big Bend National Park that takes you to the iconic South Rim, one of the best and most stunning treks in Texas. From the cliff's edge, you can see the ancient remains of some of the Chisos Mountains, the Rio Grande as it flows eastward, and the desert beyond the river into Mexico. The trip can be between 12-14 miles round trip, depending on your route, and the payoff at the midway point is worth the 2000 vertical feet and miles of walking. I stayed for a while, lingering to shoot sunset at various locations, then captured the Milky Way as it scrolled across the sky. If you are a hiker and live in Texas, this destination is a must - worth the extra effort to stand on the edge of the Texas landscape. Big Bend National Park is one of my favorite places to shoot in Texas. I try to get out there every year for bluebonnets. Some years are better than others, but something always presents itself to capture with my camera. This particular trip, I was fortunate to experience some magical sunsets with the Prickly Pear cacti in bloom in the lower elevations of the park. Only a few miles from Santa Elena Canyon in the Chihuahuan Desert, these beautiful blooms graced the otherwise rugged landscape. This little scenic point along the Zilker Park Hike and bike Trail offers an often-photographed view of the Austin skyline from across Lady Bird Lake. In the summer, the trees are green and the water is blue. But during the winter months of January and early February, this is one of the few places I like to shoot. While the leaves on the trees are gone during this time of year, at sunrise the sun ascends straight down this portion of the Colorado River allowing for some nice early morning perspectives. I had the opportunity to spend a few days at Palo Duro Canyon in the Texas Panhanhandle during the last part of November. The days were beautiful and the sunrises and sunset were amazing. Palo Duro is vast - the second largest canyon in North America. With plenty of trails to explore, it is a hike and bike paradise. One of the most famous locations is the Lighthouse, a hoodoo that sits at the end of a 3 mile walk through beautiful red-rocked canyon area. Though the path is well traveled and I saw many folks on my way there, I did not see anyone the last mile nor the rest of the trip. I hiked there in the evening to enjoy and photograph sunset, then walked back under the light of a nearly-full moon. It was a beautiful ending to a wonderful day. If you get the chance to visit, I'd highly recommend this area of Texas, though probably not in the heat of the summer months. Though this area is generally reserved for "Travels," I've recently added a new addition to my photographic capabilities. After more than a year of researching and contemplating adding aerial photography to my options, I finally entered the world of remote controlled quadcopters (also known as drones). The camera technology has reached the point where I felt comfortable shooting images that were of high enough quality that I could offer them to clients. Most single images from my flying machine could be printed up to 30x20, with a few going to 36x24 (canvas could go even bigger as the canvas material gives more latitude in printing larger images). For the panorama images, these can go even larger because they are comprised of several photographs stitched together. As I begin to build my "Over Austin" aerial collection, I'll add images to my Austin Aerial Gallery. Eventually, I hope to add images from the Texas Hill Country, and even bluebonnet and wildflowers from the spring (the spring of 2016 should be a banner year if El Nino sticks around through March or April). Stay tuned and I'll show you what Austin looks like from 200-400 feet in the air! Pennybacker Bridge, known to Austin, Texas, locals as the 360 Bridge, opened in December of 1982. The steel used in construction was manufactured in Japan, then shipped by freighter to Houston, then onto its final destination. No part of the steel structure touches the Colorado River below. The final cost was around 10 million US Dollars. These days, the structure is an icon for Austinites. Boaters, fishermen, and folks who enjoy water activities use the water beneath the bridge. From the edge of the cliffs on the northeast side, you have great views of the bridge as well as the downtown Austin skyline. Driftwood, Texas, may be best known for the Salt Lick, a famous barbecue joint on FM 150 . But this unincorporated community also has a winery, an old Texaco station, a post office, and at last count (according to the 2010 census) had a population of 2,467. Originally known as Liberty Hill, the first settlers arrived in th 1850s. The town grew, then dwindled with the ebb and flow of trading and commerce, and eventually ended up where it is today - a sleepy town where life is pretty good. On August 13th and 14th, the Perseid Meteor reached its peak, showing nearly 100 meteors per hour. I spent the early morning hours at Pedernales Falls State Park photographing this light show, along with the Milky Way as it moved across the heavens. 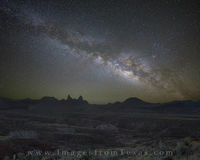 For more details about this amazing night, please feel free to visit my Images from Texas blog. 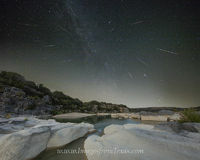 I photographed the meteor shower from both Pedernales Falls and the 360 Bridge on consecutive nights. While I was missing sleep, the opportunity to reflect beneath the night sky was an experience I'll remember for quite a while. The Boardwalk along the trail at Lady Bird Lake connect two previous portions of the Zilker Park Hike and Bike Trail. The views along this area look across the water towards the downtown Austin skyline. On a very warm summer evening, this is the view you can enjoy all along this walkway. Hillsboro, Texas, just north of Waco, may be best known for its outlet malls, but north of town are some pretty amazing fields of golden giant sunflowers. You can see these from I-35 heading towards Fort Worth after the Ft.Worth/Dallas split. Finding a location to actually photograph these beauties is another story. I drove around for quite a while and was continuously thwarted by fences and private property. I respect folks' land and will not enter without permission. I had hoped to run into a landowner, but not luck. I only found one spot I could set up a tripod. While I realize these sunflowers are technically considered wildflowers, you can see more images of these giants in my Texas wildflowers gallery. Most of Texas has experienced heavy flooding these last few weeks. I had wanted to visit Pedernales Falls State Park to photograph the river earlier this week, but the park was closed because of the flood's impact. I finally was allowed in this past weekend and took the opportunity to photograph the historically high water. What is normally a tranquil waterway is currently a ranging river running high and fast. From where I took this photograph, the water would have been over my head only days earlier, and this was as high as I've ever seen the Pedernales River. At the top of Enchanted Rock, you can see for miles and miles across the Texas Hill Country. Over time, atop that granite uplift, erosion has left depressions in the rock. When the rains come, those depressions fill with water and provide a rare and fragile ecological system for both plants and animals called vernal pools. I like to visit this location after rains because of the unique shapes of the pools. They seem to constantly change with the level of the water, and if the rains last long enough, hearty plants spring from these pools. On my most recent trip, I enjoyed photographing some of these vernal pool gems. Field Creek is a small country creek that is near one of my favorite places to photograph bluebonnets. However, i the spring of 2015, the bluebonnets did not make much of an appearance in April. However, in early May, the firewheels and bitterweed (reds and golds) could be found in abundance. Driving along Highway 71 northwest of Llano, the roadsides were filled with colors, and these colors spread into the fields, creating beautiful palettes of Texas wildflowers. North on Highway 16 just past Llano is a little town called Cherokee. I don't know much about this dot on the map, but I do know the dirt roads in this area offer secrets each spring - fields of beautiful Texas wildflowers. In May, the firewheels have the potential to fill a meadow with red. This image shows one little field at sunset along a dirt road. No wind. No noise. No people around. Just the free-range cows mooing in the distance, the wildflowers, and me. Not a bad way to spend the evening. Whenever I need to get away and have a little quiet time, I ususally turn to Pedernales Falls State Park, a little gem in the Texas Hill Country. I can be at one of my favorite trails in less than 30 minutes, and about once a month I find myself sitting on a rock watching the sun rise over the Pedernales River and distant limestone cliffs. It is at moments like these I can leave behind the stresses and responsibilities that life throws at me and reflect on the things that matter most in my life. And most times, I never see another person unless it is in the parking lot on my way back to the car. I had just about decided not to make the drive up to Llano in search of fields of Texas wildflowers. The radar showed heavy thunderstorms headed towards Mason and Llano counties, and I was tired from a morning shooting around Fredericksburg. Still, something said to keep going, so apprehensively I started the trip. About 5 miles south of Llano on Highway 71, I was forced to pull over. The rains were coming so fast and hard I could not see anything in front of me. Several cars turned around. I check the weather on my ipad and hoped those huge cells that were purple and blue moving over Llano and this portion of the Texas Hill Country would pass. I made the decision to trek on, and about 10 miles west of Llano on Highway 29, my efforts were rewarded. A beautiful rainbow appeared. I took some time to enjoy this moment and capture these colors as best I could. Then the clouds appeared - those wonderful after-the-storm clouds that are rare and unique - mammatocumulus clouds. With a solitary oak in the distance, I found a field of wildflowers sprinkled with bluebonnets, Indian Paintbrush, and coreopsis to finish off the night. On Highway 29 between Llano and Art, Texas, in the northern part of the Texas Hill Country, each spring bluebonnets can color the landscape in shades of blue. In front of the Methodist church, this state wildflower fills the lawn in front of the chapel, creating a unique and distinct Texas Hill Country scene. I only live about 20 minutes from Cypress Mill, Texas. This tiny unincorporated community in the Texas Hill Country doesn't offer much in terms of tourism. It has one winery, and its (at last count) 56 residents were mostly ranchers. Still, there are a few nice places for wildflower viewing each spring. This little patch of bluebonnets caught my attention, and after a few afternoon storms, presented the perfect foreground for a landscape containing a rare rainbow. The colors in the sky didn't last long. A few fleeting moments were all that it lingered. Feel freet to visit my gallery to peruse more bluebonnet images. Castell, Texas, has a population of 104. It is a tiny dot on the map, but it April it falls in a vibrant area for Hill Country bluebonnets and other wildflowers. On Texas Highway 152 between Castell and Llano, the roadsides and hills are often filled with blues, pinks, golds, and whites. Castell sits along the Llano River, making it a good jumping off point for flyfishing and canoing. As I work through the images from my recent trip to Big Bend National Park, I'm amazed at the diversity of this remote area. From the desert areas in the lower elevations to the trees and plant life at over 7000 feet, there is so much to be seen. Of course, one of my favorite aspects of this natonal park is photographing the Texas bluebonnets. With Lupinus Havardii (Big Bend's unique species of this state flower) in the foreground and the Chisos Mountains in the distance, I can think of few places I'd rather be at sunrise or sunset. I encourage anyone who is willing to drive a while to visit this hidden gem on the Texas/Mexico border. Seventeen million years ago, an ocean covered what is now Big Bend National Park. This past week while I was at this incredibly remote Texas park, I think that is how many stars I could count. I was excited to try out the new Canon 11-24 L lens for nighttime photography on this trip. The wide angle lens did not disappoint. After taking about 30 minutes to set up my IOptron star tracker near a Mesa overlooking the Mule Ears rock formation, I spent from 4:30am-6:00am capturing long exposures of the Milky Way as it churned across the southeastern sky. Along with my fascination with the night sky, I also devoted time to finding wildflowers, especially the Big Bend version of the bluebonnet. From both sides of the Chisos Mountains colorful blooms were abundant in this unusually wet spring. On a personal note, I was pleased to reach the top of Emory Peak, including the short class 3 scramble at the top to reach the 7825 foot summit. Unfortunately, when on the peak visibility was limited to about 25 feet in all directions because of dense fog. The crazy thing was skies were clear when I hit the trail at 5:00am. I guess that is mountain weather for you - even in Texas. Now I turn my attention to my favorite time of year in central Texas - bluebonnet season! I recently spent a few days exploring the San Antonio Riverwalk and the Alamo. Though I am a 4th generation Texan, I've never photographed the Alamo, so this was a new experience. For such a little structure, it has an amazing history, and I was excited to have this opportunity. I also learned more history about the Alamo. For all its battle history and significant role in Texas annals, did you know in 1876, some of its buildings were once sold and used as a wholesale grocery store? One morning I arrived very early - maybe 45 minutes before sunrise - to capture the building in floodlights. When the lights are facing up, they cast shadows on the 2nd floor of the outside wall. The shadows appear as tombstones (or so say the guards I talked with). And they were right. So I had to ask... had he ever seen a ghost? The guard smiled, paused for a moment, and said his bosses preferred he not talk about such things... but yes, he'd experienced some unusual happenings in his time on the nightshift at this place where so many men died on March 6, 1836.